The Hour of Twilight is here! You are here: NECAOnline.com » Blog » News And Announcements » The Hour of Twilight is here! “When you can live forever, what do you live for?” Straight from the hit Twilight motion picture, NECAonline brings you Edward Cullen. 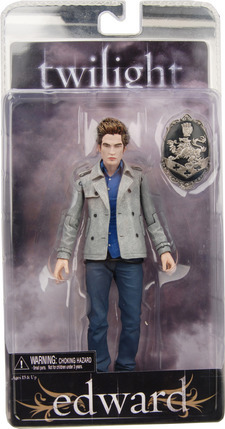 This 7” action figure comes packaged with the “Cullen” family crest and 10 points of articulation. Edward sports his trademark scowl he’s been recognized for since his 1918 transformation. The trademark scowl on his face solidifies his position as a self-proclaimed antihero. Edward is hitting shelves now and can truly “live forever” in your collection. An “Edward and Bella” Two-Pack will be available later this Spring. Take a look at our official “Edward” images and keep checking back with NECAonline for more Twilight information. We will solicit any Twilight news as it becomes available.